Quotes and notes below, for anyone who hasn’t time to watch the whole thing. Mainly comments I found most interesting. Yes, it is biased. I’m allowed to be, it’s my website. Add a comment to redress this if you wish. Outlining the works that have taken place. Said there had been consultation, and that there were only ‘a handful’ of concerns/objections raised on the possible removal of the cart tracks and setts. I just want to remind everyone that one of that ‘handful’ was English Heritage. So if the council improvement projects ignore their wise advice, then I doubt they’ll take much notice of us. But still. The point has been made. And many of the comments below show that it has been noted. Mention of the ‘heritage brigade’ (who are they? I’m in no ‘brigade’). Discusses ideas of authenticity/appropriateness regarding heritage. The 1970s remodelling it was ‘probably an exemplar scheme of its time’. Reminds us of the city’s historic importance and how much it is valued by visitors: ‘…we are the custodians of that heritage’. Congratulates petitioner on getting so many signatures. There was a consultation. In the future consultations could make it clearer: more diagrams, models etc. Thinks Reinvigorate York programme is important, to improve ‘visitor experience’ & city centre in general. Need to ‘keep York very vibrant’. ‘On lots of levels Kings Square is better’ ‘I personally like it.’ But council could have been better at showing options. Reiterates the view previously expressed that it would be a waste of money. ‘In my view it now looks bland and bleak’. Looking very dirty already and will need regular pressure washing to keep it clean. Difficult to see what could be considered a traditional surface. Shows photos of square at different times, with different surfacing. ‘Now, most of us want a traffic-free city centre’ and thinks smooth surface more appropriate for that, and for the future. ‘People – when they come to York – no one has ever said to me, ‘That square really needs half a million pounds spent on it to make it look like a shopping plaza.’ Instead say city is untidy, dirty in places. Welcomes petition, it shows how much people care. Jokes that Daily Mail is ‘really not a reputable paper’. Obtained figures on number of people who have tripped on King’s Square paving. Ten minor accidents in ten years. None involved compensation claims. Says it will be interesting to see how many there are as a result of the ‘skating rink’ created by the new paving. But acknowledges Cllr Merrett’s comment that it’s too late as the job is done. There are many other pages on this site on the subject of King’s Square, going back to summer 2012. The most important is probably this one, written a few months ago: A changing aesthetic. Thanks to Michelle Wyatt for taking this debate to the council and making more people take notice. The claim by James Alexander of the ‘revenue impact’ being £45,000 per year might be explained by the fact that CoYC has spent what is believed to be £500,000 capital (i.e. a borrowed lump sum, plus annual interest presumably affecting CoYC’s revenue account) that will cost an annual amount of £45,000. Without knowing how £500,000 is amortized and over what period, one can only presume the figure is correct. Perhaps a more accountancy savvie City might correct me or JA’s phraseology? Sure we can discuss here I hate twitter you can only say 2 sentences. I dont believe the change would increase profit anywhere to get £45,000 per year. I also dont see how not changing would cost £45,000 per year. The fund raising for all this is the Lendal bridge fines which is totally destroying the tourist industry. He might have been answering the conservative debate point about the annual cost of the debts incurred. These projects create debts & that was one of the big point of arguement. Labour from what I see are big on benevolence and helping the poor, whereas Conservatives seem to be more about getting everyone to be independent of government. In the debate labour claimed the conservatives did nothing for York during its 8 years in office. I got a similar arguement from the architect who designed Kings Square..basically that there have been no projects to improve York since 1991. I think because we are not only in the heart of Yorkshire but reaping wealth from tourism that we like it that way. People like the old worn stonework and they like it whenever wallets are kept tight. I have a friend who always makes fun of me calling me free no extras because Im always looking for things where I dont have to pay. I am a total tightwad and even if I came into money I would still bargain hunt. This Reinvigoration is offensive to Yorkshire culture because it is reckless overspending and its removing memories & connections with the past (our roots). We dont want to forget our traditions, our elders and we want the wealth that comes from the old stonework too. I too noticed the repeated mentions of no improvement projects having happened for years/since 1991. I wondered if it was similar to the view of York promoted by the council leader a while back to a journalist from the Economist, that nothing much happened in York until this Labour council took office, ie self-promotion and putting a certain spin on things. I’m trying to think what these improvement schemes 20 years or so ago would have been. Parliament Street ‘improvements’ perhaps – that now non-spouting fountain and the now demolished ‘Splash Palace’, the not very successful trees and the extremely wonky paving which is much worse than King’s Square? 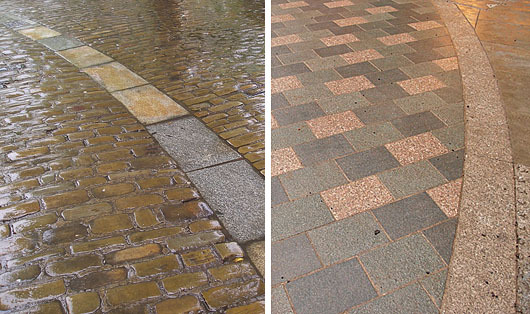 Or perhaps the over-fussy and ‘cheap’ paving on Coney St mentioned by James Alexander. An awful lot of money wasted on these ‘improvements’. But is it change with any vision, or is it ad-hoc? Increasingly I think it’s maybe better if changes are ad hoc and small scale rather than a ‘vision’ imposed? Seems to suit York better? Glad you mentioned Library Square though – that does seem to work well? Looks good? Apparently it has been a Labour or LibDem or ‘no overall control’ council for years, since 1995 at least. I find party politics somewhat tedious and strange. Think that come 2015 I’ll be forgetting any party loyalty/voting habit I had before (Labour) and more interested in the individuals standing as councillors and how they come across, who seems like a ‘good person’ doing their best. And on how well they understand York, and, in particular, its heritage. I was tempted to sign Michelle’s petition, since I agreed with her premise that King’s Square didn’t require the complete overhaul. That was, until I realised her troop was misrepresenting the entire position based on half-truths and misinformation about the “historic” nature of the site and the “cultural damaged” the project would have on it, much like the Daily Mail article. I haven’t enjoyed the lack of transparency from either side of this “debate”, and it does York no good. Especially when it’s too little too late. And truthfully, I don’t think the “feel” of the place has suffered as a result of this. The open bit of the square looks almost exactly the same, and it’s unlikely any tourists will be put off by the new track. It’s a shame that it was such a waste, because King’s Square only needed a little doing to fix the problems. I wasn’t part of the group and have never met Michelle and discussed it with her in person, but have read all the interviews etc and also some of the Facebook postings on this. As I understand it any ‘misrepresenting’ was a result of not knowing, to begin with, the exact situation regarding what was being removed and replaced. I think you’re referring to the ‘1970s cobbles’. To be fair, I’ve been interested in this since the consultation in February, if not before, and had read a lot of info, and it was only relatively recently that it was made clear to any of us the correct info regarding the square’s cart tracks and setts. Once the group realised the facts I believe the petition was reworded? Michelle can clarify if she wants to of course. So any ‘half-truths and misinformation’ were a result of the council’s failure to provide enough information, perhaps. I don’t think one woman sitting on the street quietly collecting signatures has any duty to the public regarding ‘transparency’ – but the local authority spending other people’s money does? Whether the feel of the place has suffered clearly depends on what you valued about it before, and whether that has been removed. As Cllr Semlyen says above, it is to some extent a matter of different tastes. And whether something has ‘meaning’, is again very personal. Agree with you on the last sentence. And on the positive side, these things maybe make us all think more about what we value and why. And maybe all of us, if we do care about these changes, need to look out for future consultations and make our views known at an earlier stage. I tried to advertise the King’s Square consultation on here, but clearly I failed too to get the info out to enough people. I’ve gone back over the text above and added in next to the councillor names their party, and below that the time on the video they begin speaking. I’ve also added in the two speakers I missed out and a few more quotes/notes.